A democratic case for Catalan independence? Spain would be irrevocably changed if Catalonia secedes. Therefore this should be a choice not just for the Catalan people, but for all Spanish people. Demotix/Sarai Rua Fargues. All rights reserved. "We have a democratic mandate," said Artur Mas, the Catalonian leader, after the regional election on September 27. Separatist parties had won a majority of seats in the Catalonian parliament in the election they had promoted as a plebiscite on secession from the rest of Spain. But do they? What is the democratic argument in the matter? The separatists did not win a majority of votes, they gained 48 percent, and their majority of seats is a slim one. But set that aside. Say there is a valid majority in the regional parliament for secession. Is that a democratic mandate for the right to leave the union? - in so doing, the majority has a duty to respect the interests of relevant minorities. Democratically, the question of whether Catalonia remains a part of Spain or leaves the union is to be settled by the majority. But which majority? People who live in Catalonia have an interest in the matter. But so do the people who live in the rest of Spain. 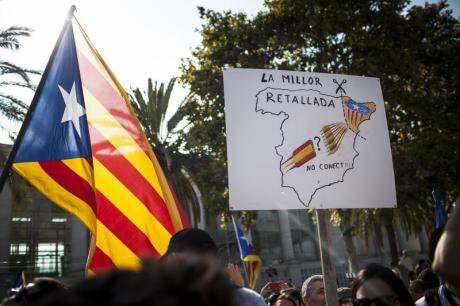 If Catalonia were to secede, the remaining Spain would be a different country. The relevant constituency in the matter, then, is all Spanish people. Even a majority in Catalonia is a minority in Spain and can have no democratic right to change all of Spain. Mr. Mas is right that he has a democratic mandate. But his mandate is only to seek succession. There is no democratic mandate for people in Catalonia to decide on the matter. How strong, then, is that (limited) mandate? Since there is (at least) a large minority within Catalonia against succession, Mr. Mas’s mandate must be said to be a weak one. The minority has a right to have its interests respected. The question of independence is one of great principle. A small majority in a population hardly has a right to simply impose its will on a large minority in an important matter. Mr. Mas’s mandate to seek succession must contain a duty to persuade the doubters in his own population. Before he could argue with force for Catalonian independence in the rest of Spain, he would need to show that he has at last a solid majority in his own population behind him. The Spanish government is a long established one. From the Catalonian side, it does not seem that strong arguments are given for secession, and certainly nothing of the kind suggested in the American declaration. It seems mainly to be a case of resentment. It is said within Catalonia that the relatively wealthy province is being forced to subsidise poorer areas in the country. But that kind of redistribution within a country is standard and obviously nothing like despotism. However, the Catalonian leaders still do have a democratic mandate to seek independence. They therefore represent a minority within Spain with a valid interest in a vital matter. The rest of Spain therefore has a duty to respect those interests of that minority. One way to do that might be to negotiate with Catalonia for a different constitutional settlement. But, again, if such negotiations were to result in proposals for a radical centre-provincial realignment, the democratically relevant constituency for deciding on that realignment would be the entire Spanish population.